Air Conditioning Repair Hillsborough County: What Size AC? You probably don’t need us to tell you that air conditioning units come in a variety of sizes. After all, it takes a lot more energy to cool down a shopping center than it does to cool a two bedroom house. So when it comes to selecting your air conditioning unit, what size do you need? How can you tell which unit will cool down your space efficiently without demanding too much energy? The answer is measuring. You can measure the area to be cooled, and you’ll have a great idea of which size air conditioner you need to keep your home comfortable. If you don’t remember from your geometry classes, you can calculate the size by multiplying the length of the space by the width of the space. This is the area. In general, it takes about 25 BTU (British Thermal Units) per square foot to cool the area, so take the area of your home and multiply that number by 25. This resulting number is the minimum BTU air conditioner you should purchase. However, it never hurts to go a little over this BTU number. One that matches exactly may have to work non-stop to keep the area cooled. 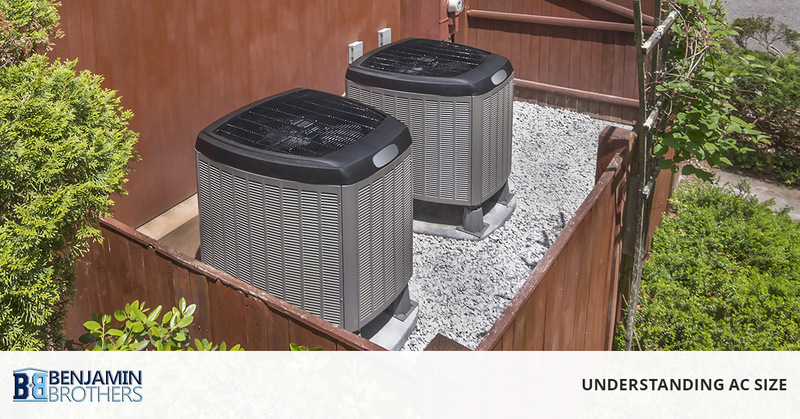 An AC unit that is too big can lead to all sorts of issues that go just beyond cooling your home. In fact, if an air conditioner is too large, it will cool the area quickly but could get in the way of the reason why you need to run your AC in the first place. Your air conditioning cools your home, but it also works to extract humidity from the air. Even if the air is cooler, if your AC unit doesn’t run for enough time, then it won’t be able to get rid of the humidity. This means your indoors will likely feel like you’re just sitting outside on a cool, humid, and muggy summer night. Also, an air conditioning unit that is too big will likely flip on and off often, which will require more electricity and skyrocket your bills. It’s best to contact a team of professionals to decide which size will fit your home best. However, if your AC is too small, then it will have to run constantly. It will spend most of its days trying to reach the desired temperature, and it will have a hard time effectively cooling your home. This constant running at your unit’s highest ability will use a ton of electricity and raise your bill. Your contractor should ask questions about your insulation and the history of your home. Anyone who takes a look at your house and automatically gives you a size may not be doing their due diligence to find out what the best choice is for you. Consider replacing the ductwork in your home and not just your air conditioning unit. Improper ducting is like having a clogged drain – it doesn’t matter how well the faucet is running if the pipe won’t let the water through. The same is true of the air ducts in your home. After you find out which size is the best fit for your home, then it’s time to begin researching various brands. You can make comparisons through online reviews and by asking your contractor their opinion. Your air conditioning unit will make a large difference in how much you pay each month to keep your home cool, how effectively your home can keep out moisture, and how comfortable your home feels during the year. That’s why it’s important to contact a team of professionals who can assess your home and give you a fair estimate of what it will take to either repair your air conditioner or replace it, if needed. Let us handle the details, from calculating what size AC unit is best for your home, to removing your old unit and installing the new. We look forward to keeping your Hillsborough County home comfortable the whole year through.